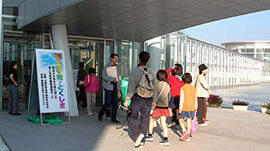 ISAS Space School was held at Asutamu Land of Science Park in Itano-cho, Tokushima on December 8 (Sat.). Despite it being a bitter cold day and a parents’ school visitation day at nearby schools, a total of 461 people attended. 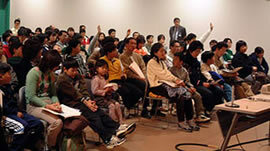 The first period was a lecture on “Challenging the Mysteries of the Solar System” (delivered by Hiroshi Yamakawa and Toshifumi Mukai), the second period on “Future Space Technology” (by Shujiro Sawai and Koji Tanaka), and the third period on “Galaxy and Black Hole” (by Yoshitomo Maeda and Issei Yamamura). There were so many challenging and intriguing questions raised that lecturers had to give careful thought to their answers: for example, “People say that a strike by lightning is a promise of a good harvest, but why so?”, “Even if spacecrafts get cheaper, we are still in trouble if the house rent in space is high”, “What is a black hole made of?”, etc. A special exhibition “Space Science and Orbiters” was concurrently held in another room, where satellite and rocket models and future missions brought in from ISAS were displayed. This exhibition will be held till 17th with the assistance of companions under ISAS Ms. Miwako Shuto’s leadership. The venue called Asutamu Land is a vast, well-arranged ground, where outdoor exhibits are also displayed in addition to across-the-board hands-on exhibits in the Child Building. Everyone from ISAS enjoyed it fully and came back to Tokyo hoping to come back again.